Cook Islands Olympic connection - Site de spbbf ! After four years of steady development for the sport of bodybuilding, following a Gold Medal win by Teinaki Rasmussen in the U70KG division at the 2007 Games held in Samoa, WBPF Director for Oceania, Philip Hope (a past Team Manager for Cook Islands) is very pleased to see the Cook Islands now has established a robust and active national federation that is recognised by their National Olympic Committee. In fact the President of the Cook Islands Bodybuilding Federation (CIBBF) is none other than George George, Chef Demission for Cook Islands National Games Team for the 2011 Pacific Games. 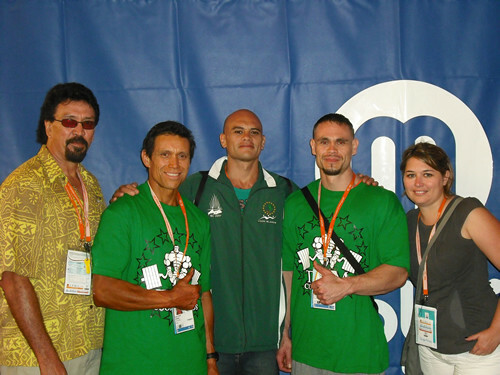 George is pictured on the far left standing next to bodybuilding champion Dean Teiho who represented the Cook Islands at the Inaugural WBPF Men’s World Championships held in Dubai in 2009, together with other team members.